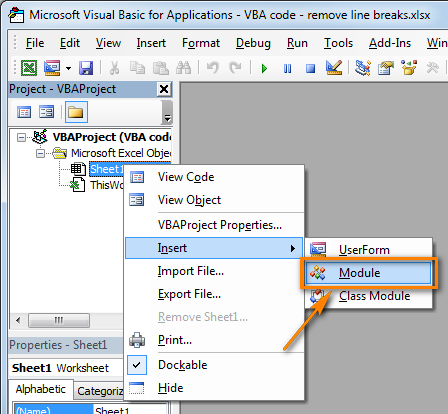 This is a short step-by-step tutorial for beginners showing how to add VBA code (Visual Basic for Applications code) to your Excel workbook and run this macro to solve your spreadsheet tasks. Most people like me and you are not real Microsoft Office gurus. So, we may not know all specificities of calling this or that option, and we cannot tell the difference between VBA execution speed in Excel 2010, 2013 and 2016. We use Excel as a tool for processing our applied data. 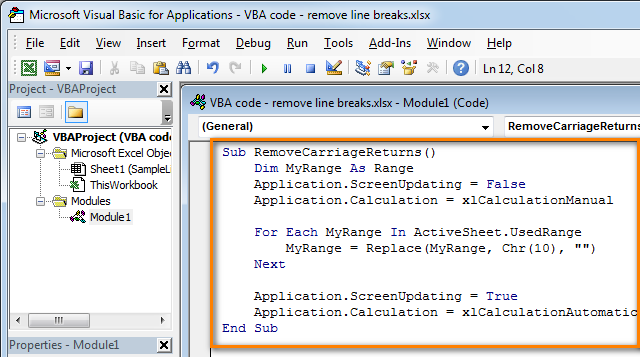 For this example, we are going to use a VBA macro to remove line breaks from the current worksheet. Press Alt + F11 to open Visual Basic Editor (VBE). Right-click on your workbook name in the "Project-VBAProject" pane (at the top left corner of the editor window) and select Insert -> Module from the context menu. Copy the VBA code (from a web-page etc.) 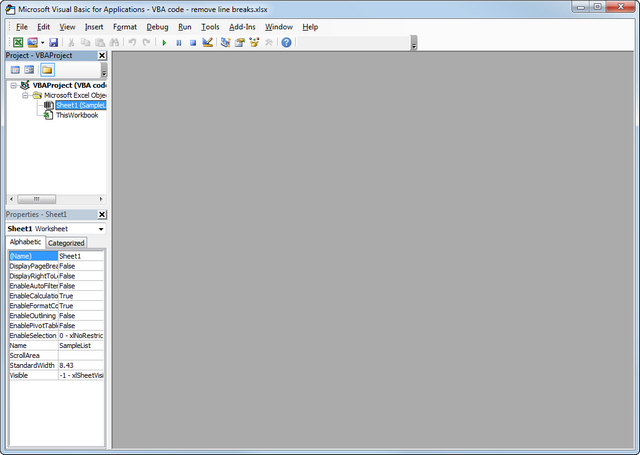 and paste it to the right pane of the VBA editor ("Module1" window). Tip: How to speed up macro execution. These lines, as their names suggest, turn off screen refresh and recalculating the workbook's formulas before running the macro. After the code is executed, everything is turned back on. As a result, the performance is increased from 10% to 500% (aha, the macro works 5 times faster if it continuously manipulates the cells' contents). Save your workbook as "Excel macro-enabled workbook". 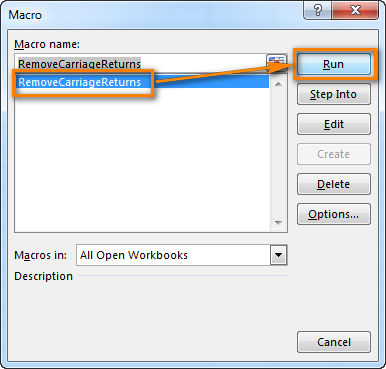 Press Crl + S, then click the "No" button in the "The following features cannot be saved in macro-free workbook" warning dialog. The "Save as" dialog will open. 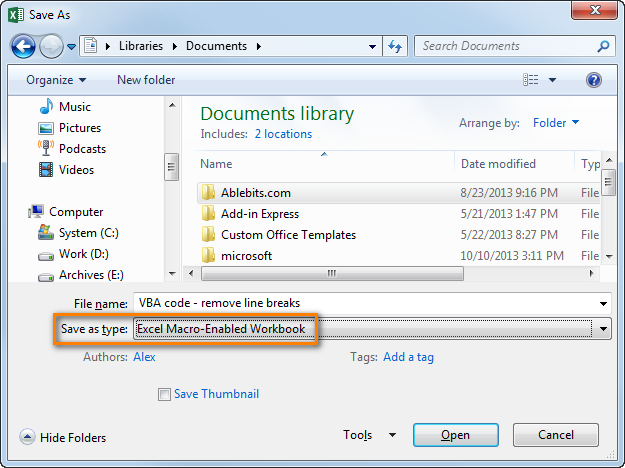 Choose "Excel macro-enabled workbook" from the "Save as type" drop-down list and click the Save button. Press Alt + Q to close the Editor window and switch back to your workbook. When you want to run the VBA code that you added as described in the section above: press Alt+F8 to open the "Macro" dialog. Then select the wanted macro from the "Macro Name" list and click the "Run" button. 155 Responses to "How to insert and run VBA code in Excel - tutorial for beginners"
Hi, I added a VBA code for a new Formula (CONCATENATEIFS) and it works greate but the only problem is that its super slow, I tried to use your speed up tip but it ended up slower (probably because I dont know where exactly to put it because the formula doesn´t have a Sub line) Can you help me?
' Does cell in criteria range match the condition?
' Were all criteria satisfied? Hi this is Sohaib. I have learned the VBA for converting numbers into words but I also want to add the word "only" after converting the numbers into words. Please help if you can. Thank you so much. Big help. If i can't save file after i add this VBA code. It says that there is an error and Excel may able to save file by removing or repairing some features. Options are to click continue or cancel. When clicking continue it want to save file as another one, but in the end it says :file was not saved". I would appreciate if someone could help me with some VBA coding I need to do. I am creating a userform for an excel document. It is quite simple but I really dont know how VBA coding works. I have 6 categories in my spreadsheet that have got to filled up in the form with numbers from 1/10 and then there is a comments box to for extra comments and a name box for the user name. finally it has 2 command boxes: Add company and close form. Can someone help me out with the code so that once the form is filled and the command box for add clicked all the information goes to the spreadsheet? I just want to say thank you for this fantastic, simple solution and for your awesome products in general. I tried your code but it doesn't do anything. No messages, nothing. What am I doing wrong? I have made a user form with 7 entries. I would like to have an Even number to become a Red font through my user form. So if the number is 346 then this number and all the other 7 boxes become a red font. Any help would be greatly appreciated. I just don't know what to write. Hi I am trying to create a template workbook for some data analysis. I have worked it up but now need to delete the data and save it as a template. I was just wondering if you have a workbook that has a VBA code attached if it is save as a macro enabled workbook do you have to add the code again when you reopen the workbook? When you put the VBA in the module and saved it, the code would be in Excel. It would be available to be called from inside that workbook. Click Alt-F8 and you can see what code is available in that workbook. You should see the names of the modules you built and saved. I want to thank you for this code and tutorial. I don't write VB code and just need a quick solution to a problem and this resolved it. Thank you so much for your time and effort. I only need to remove carrigae returns in 1 column in my case Column H.
How can I define the range to be H, and not the whole sheet? Is import function runs in excel 2010? previously i created a code using import function to import .bas file into many excels sheets by running this code. now this in not working for excel 2010. can anybody please help me out here? I performed the task but my spreadsheets did not merge what did I do wrong? All of the examples I followed but after the Alt F8 I was lost because it did not show what to do next or what I should be looking for.